If you’re wondering what the hell’s going on in that second panel, be sure to read tomorrows strip @ PC Weenies. That’s all I’m saying. 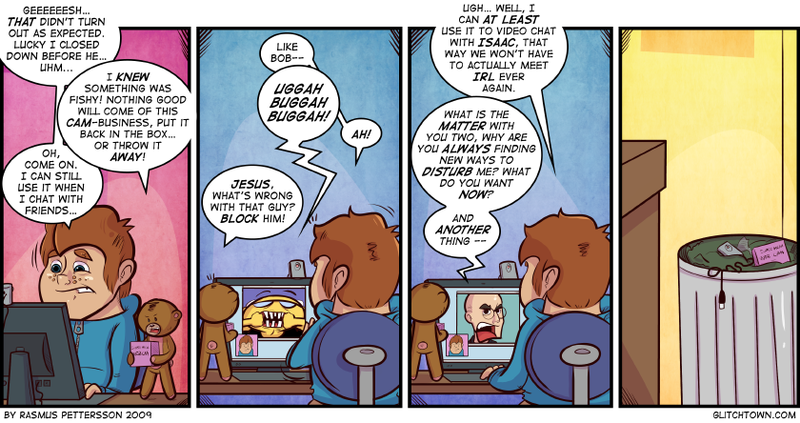 This is actually the third time Bob’s making a cameo, btw. I guess this concludes this short webcam-arc. I’m actually glad they threw it away, cause I wouldn’t have wanted to keep drawing that on top of the screen, hah. Oh, also. That box reads “Super Mega Web Cam”. It’s not important to see, and you probably can’t either, but if you wanted to know, well… that’s what it says. This entry was posted on Monday, May 18th, 2009 at 6:00 am and is filed under Comic. You can follow any responses to this entry through the RSS 2.0 feed. Both comments and pings are currently closed. Just thought I’d let you know that I’m not going to read this comic any more because of the blaspheming. I’m also not gonna read anymore, because you said Isaac, and I belive in the religion of Sir Isaac Newton, and you just mentioned his name in vain! Shame on you! You will surely burn in the physicists hell! Great expression on the first panel. He looks totally disturbed. I would be too. Thanks thatguy. I think we all would.